The DIVAR IP 7000 family is an affordable, simple and reliable all-in-one recording, viewing and management solution for network surveillance systems of up to 128 channels (with 32 channels pre-licensed). 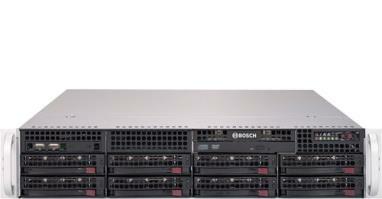 Running the full Bosch Video Management System solution and powered by Video Recording Manager software from Bosch, DIVAR IP 7000 is an intelligent IP storage device that eliminates the need for separate NVR (Network Video Recorder) server and storage hardware, reducing the total cost of ownership by as much as 45%. DIVAR IP 7000 2U is a 2HU rack mount unit that combines advanced management and state-of-the-art recording management into a single cost-effective, plug-and-play IP recording appliance for IT-minded customers.